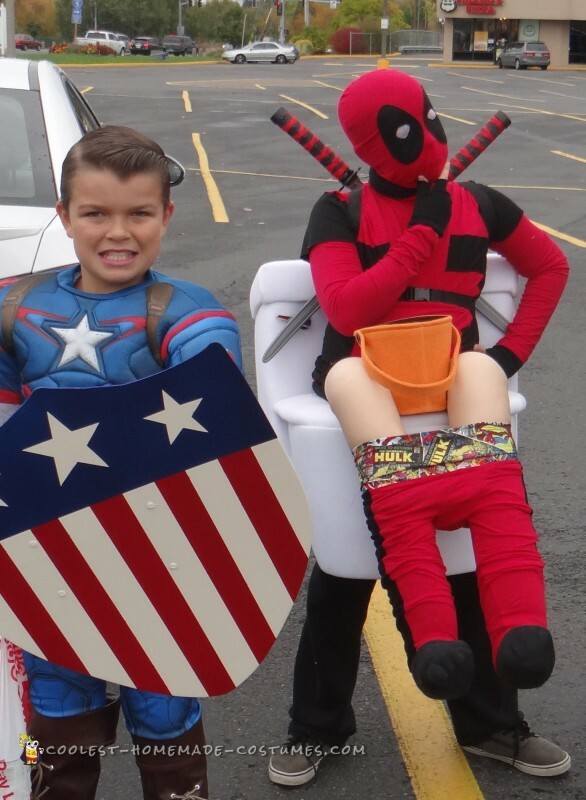 This is what happens when your 11 year old can not choose between two costumes. 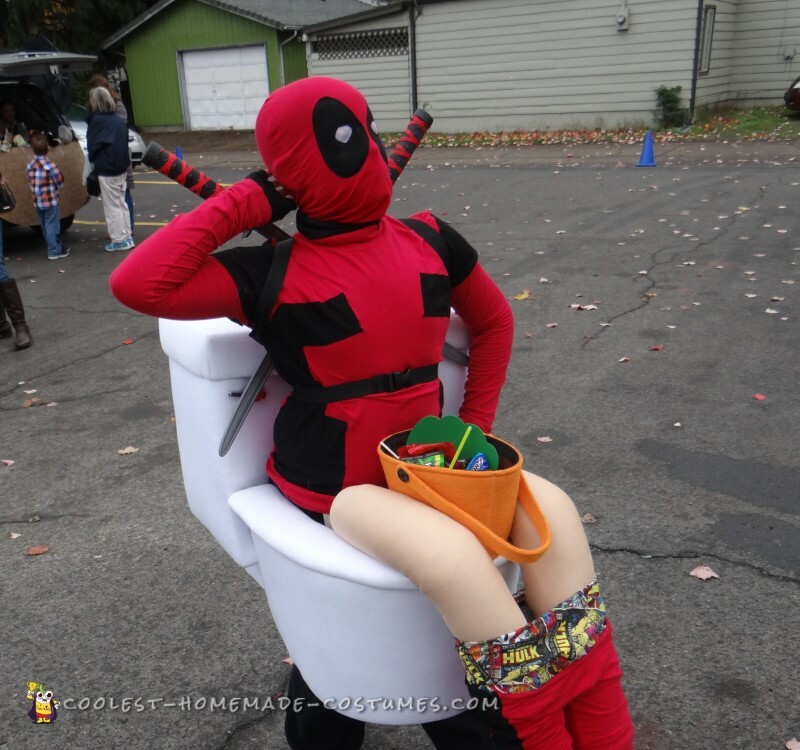 My son wanted to be both a toilet and his favorite Marvel character Deadpool so we combined them to make this. I used two red turtleneck shirts one for the top and added black fabric over it to resemble Deadpools outfit. The mask was made from the other shirt with black added to the top around the eyes and cheesecloth was sewn in to see out of. I had never sewn a mask before so I started big and took it in a little at a time until it fit. We then used a large wire oval basket and two cardboard boxes for the back of the toilet with a smaller box under that for support. This step required alot of white duct tape and hot glue. The toilet lid was made of carboard layered several times and taped with more white duct tape. I made straps out of even more white duct tape that came up and hid under his shirt. With another strap added to the back that helped hold the back up straight and had a clip on it in the front to keep it tight. The boxes and basket are covered first with with batting to hide any bumps and seams that were showing as well as any print on the boxes. The cotton fabric was added over the entire thing to make it look like one piece. I used alot of hot glue and just pulled and tucked until it looked smooth. The toilet handle was just from Home Depot fror about $4 it was not worth trying to make one to me. The legs were pool noodles and i used the remaining fabric for the pants. 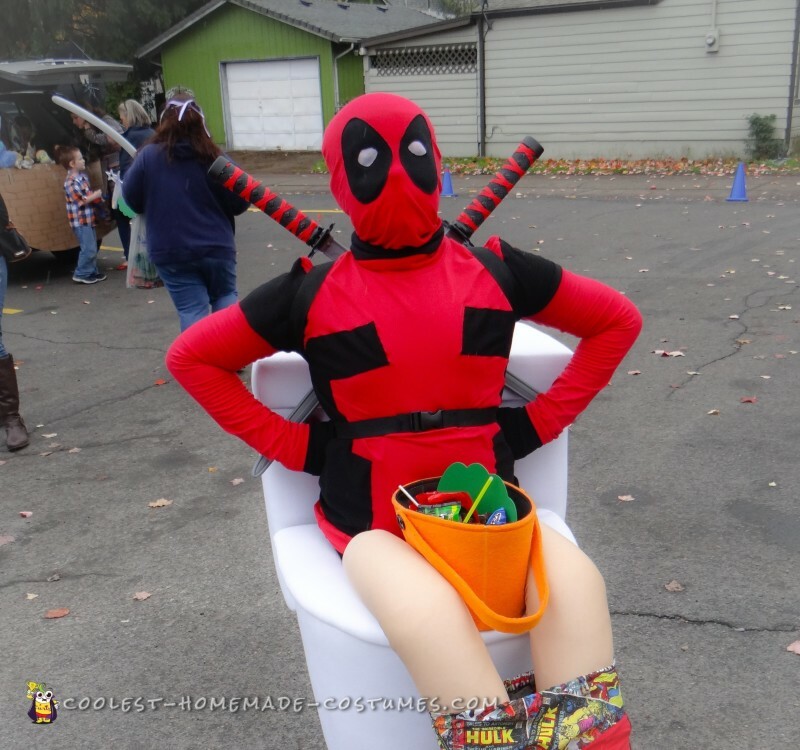 He had alot of fun and got alot of laughs from this costume. It was also alot of fun to make.